New York City, NY beholds an incomparable wealth of cultural and ethnic diversity with art treasures from around the globe. Among its many virtues is providing a home for one of the world’s largest collections of Himalayan art. The Rubin Museum of Art, which opened in 2004, is the premier museum in the West for Himalayan art and the surrounding regions. This spacious 70,000-square-foot museum, located at 150 West 17 Street, near 7th Avenue in Manhattan, is a treasure trove of spiritual art. Serene intimate galleries showcase ritual sculptures in addition to many brilliantly colored thangkas, (also known as tangka, thanka or tanka), and much more. Thangkas are paintings on cotton, or silk appliqué, usually depicting a Buddhist deity, scene, or mandala of some sort. The centerpiece of the museum is “Masterworks”, a regularly rotating exhibition that encompasses a period of more than 1,000 years. It represents the museum’s stylistic diversity and the connections between Himalayan and neighboring artistic traditions. On the second floor of the museum is an extraordinary Tibetan Buddhist shrine room that has received rave reviews by both Buddhists and non-Buddhists alike. The museum also includes space for contemporary and historical photography, an art-making studio, a state-of-the-art theater for multimedia events and performances, a café, and a gift shop. There is an Education Center adjacent to the museum’s primary building. Red Wolf Headed Protectress. Central Tibet (19th century), pigments on cloth from the “Bodies in Balance” exhibition. Photo Rubin Museum of Art. 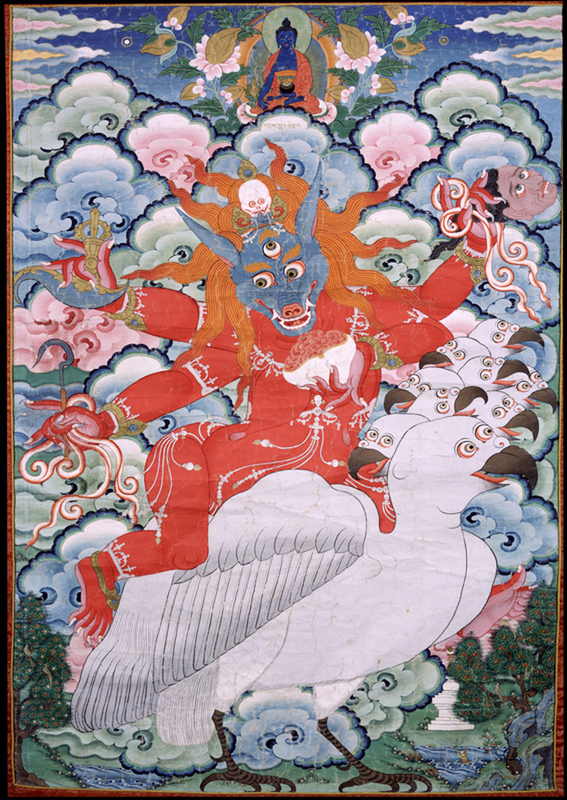 Unlike other types of Buddhist art, Himalayan art contains a myriad of detailed iconography. For instance, deities depicted in various gestures and poses, holding decapitated bodies, surrounded by floating skulls, animals, birds and strange looking creatures may be confusing and frightening to individuals who are uneducated about this type of imagery. Fortunately for visitors there are expert museum guides that help to demystify and decode the symbols. They offer free scheduled tours in addition to informal conversations to explain the cultural, geographic, historical, and stylistic contexts of the exhibitions and individual works of art. Three Medical Trees, from the “Bodies in Balance” exhibition. Photo Rubin Museum of Art. “Bodies in Balance”, on view through September 8, 2014, is the first major exhibition to explore the guiding principles of the Tibetan science of healing. Curated by Theresia Hofer, it demonstrates the advancement of Tibetan medical knowledge, a system based on three forces – wind, bile, and phlegm – that govern physical and mental aspects of being. It features approximately 140 objects – from medical paintings to manuscripts and medical instruments, dating from the 9th century to the present day. To enhance the visitors’ experience a multi-media installation shows how Tibetan medicine is used today. There is also a pulse station where visitors may feel their pulse according to the Tibetan practice. 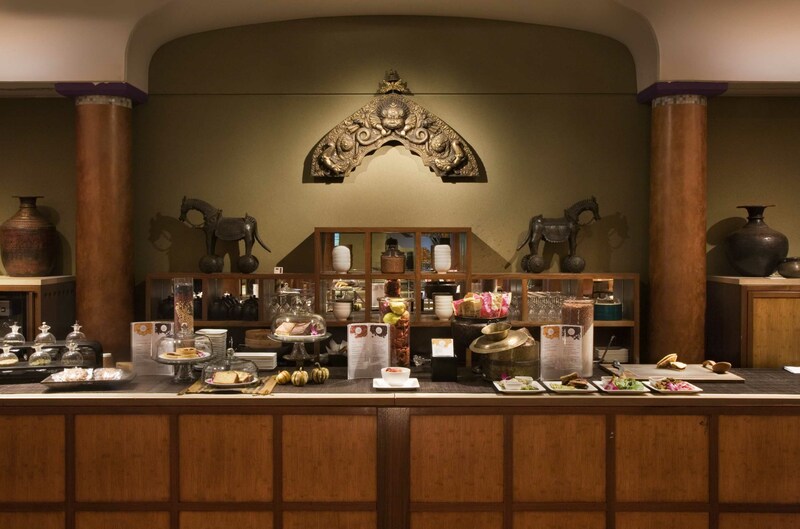 A visit to the Rubin Museum is not complete without dining in Café Serai. Executive Chef Ali Loukzada, who was born and raised in Mumbai, India, brings superb dishes inspired by the Himalayas. The menu boasts many seasonal specialties such as Thali plates and handmade traditional momo dumplings in addition to a wide range of soups, salads, and assorted vegetarian and regional specials. An assortment of delectable desserts may be savored along with a selection of specialty teas, chai, and coffee. India East installation. Photo Rubin Museum of Art. In addition to presenting exhibitions based on the museum’s permanent collection, the Rubin Museum also serves as a venue for national and international traveling exhibitions. 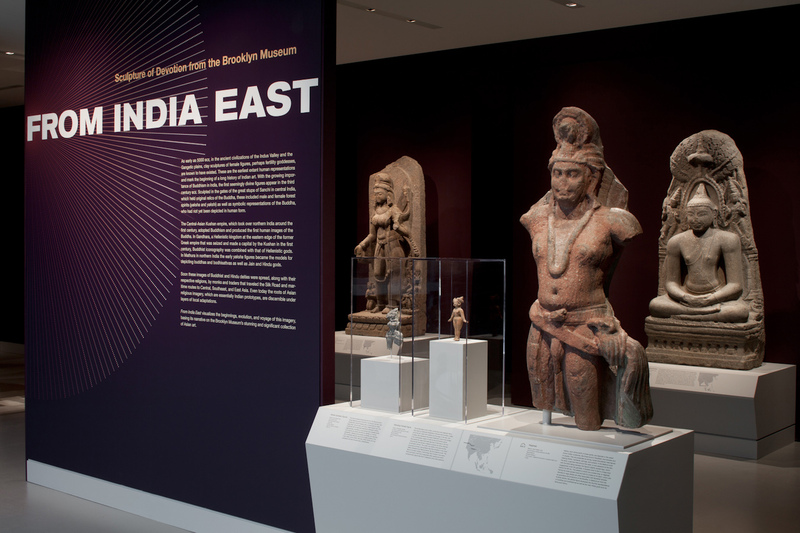 The exhibition “From India East”, that originated from the Asian art collection from the Brooklyn Museum, is one example. “From India East”, on view through July 7, 2014, features art from Burma, Cambodia, Indonesia, Thailand, Korea, and Japan. The works were chosen by the Rubin Museum’s curators to trace the development of Buddhist and Hindu sculpture back to its roots in the art of ancient India. 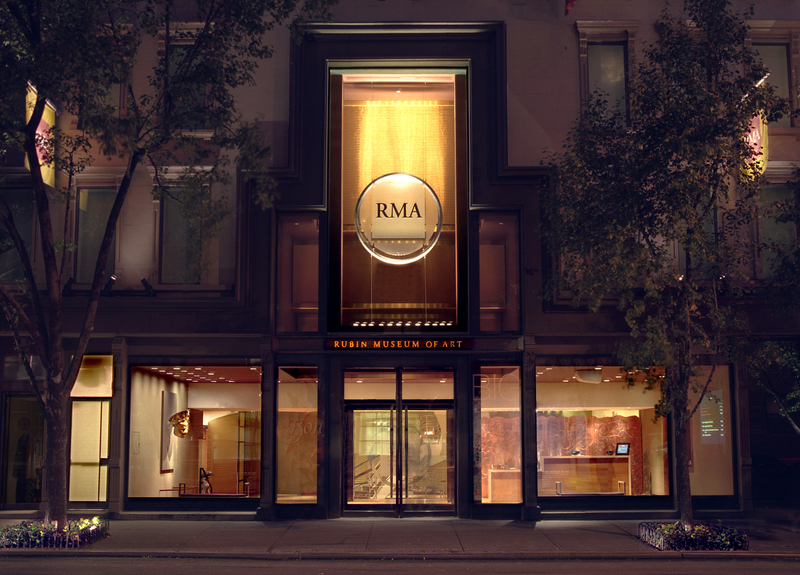 The Rubin Museum of Art originated from a private collection of Himalayan art assembled by Donald and Shelley Rubin. 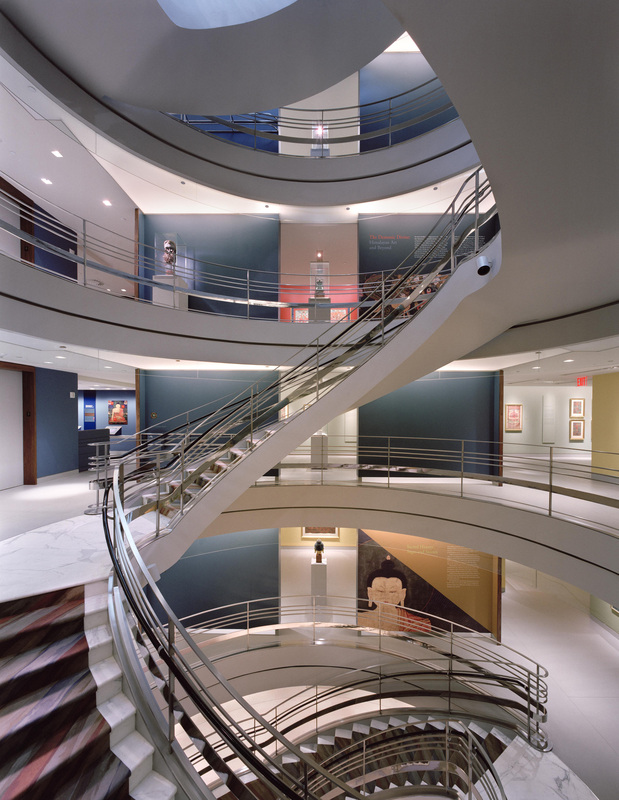 In 1998, the Rubins purchased the building that was formerly a portion of Barneys New York, the designer fashion department store. The museum is open daily except for Tuesday. The admission is $15.00 for adults and $10 for seniors and students. Admission is free to members and children 12 years and younger. Thank-you for this post featuring one of the treasures of New York City. As you pointed out, the museum does a great job of demystifying what might seem to be difficult to understand. The atmosphere is very welcoming; there are Friday evening cocktail hours and a wide range of special programs, including lectures, concerts and classes. Watercolorist, Janet Morgan, will be teaching classes on painting deities (both traditional and urban contemporary) this fall.